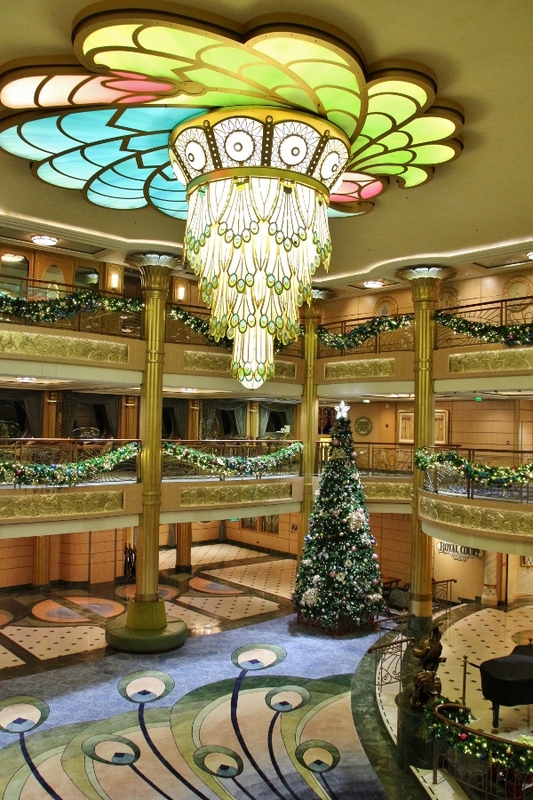 As much as I love visiting exciting ports of call, and plan my cruises based on their itineraries, sea days aboard Disney Cruise Line are my favorite! There's so much to do, or not do, depending on your preference. 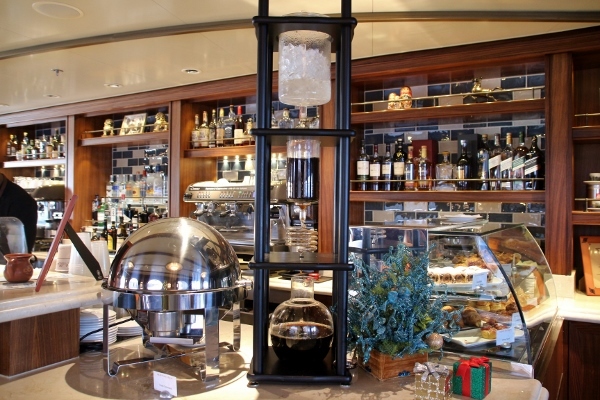 There are multiple areas of the ship where you can relax regardless of your age. There are water activities ranging from several pools and splash areas to a splashtastic water coaster called the Aquaduck, fun games and activities such as the Midship Detective Agency and Goofy Golf, and of course there's also the incredible Senses Spa, not to mention movies, arts and crafts, cooking demonstrations, and so much more. You can read much more about many of these activities here. 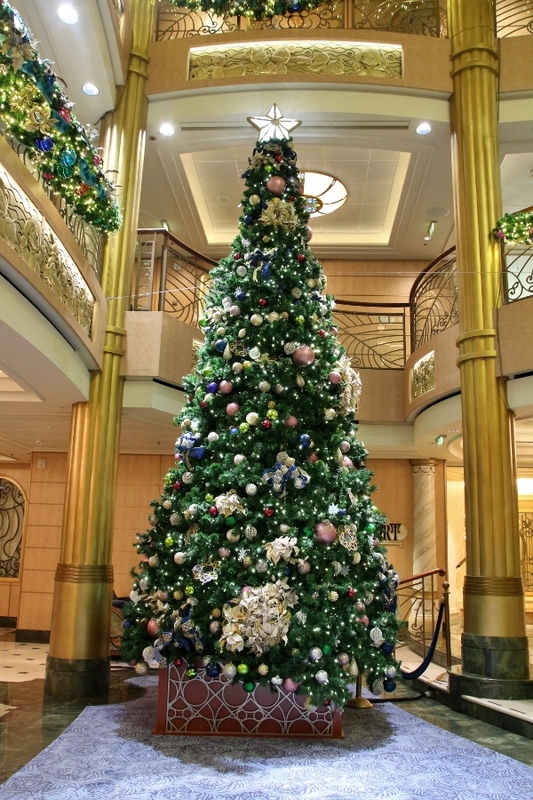 We certainly weren't able to do all of these things in a single sea day, and we didn't even manage to do them all on this cruise, but it's just great knowing you have options. 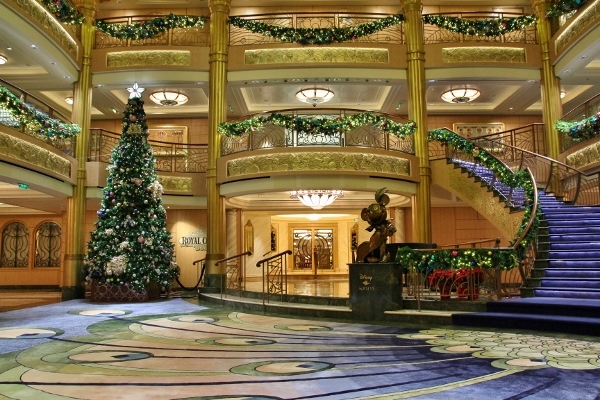 This was our first morning waking up aboard the Disney Fantasy, and I unwillingly woke up crazy early and took the opportunity to wander the nearly silent cruise ship taking uncrowded photos of the gorgeously festive atrium. I was out the door by 5:40 am and definitely made out well on the photo front. Not a soul in sight. I also got to enjoy the calmness of the jogging track on deck 4 before the sun officially peeked over the horizon. 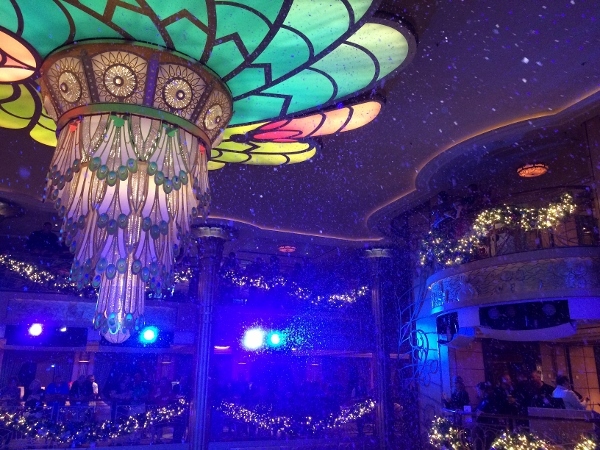 It was stunning and an incredible way to begin our fun-filled day. A short while later, we headed up to the Quiet Cove area of the pool deck, which is the 18+ (adults only) section. 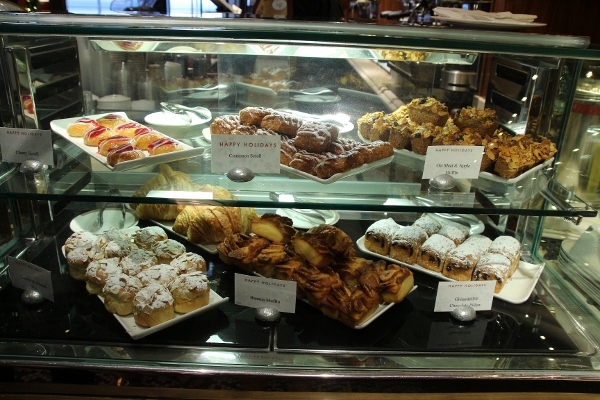 There we made out first stop of the week at the Cove Cafe to indulge in their specialty coffee drinks and pastries. 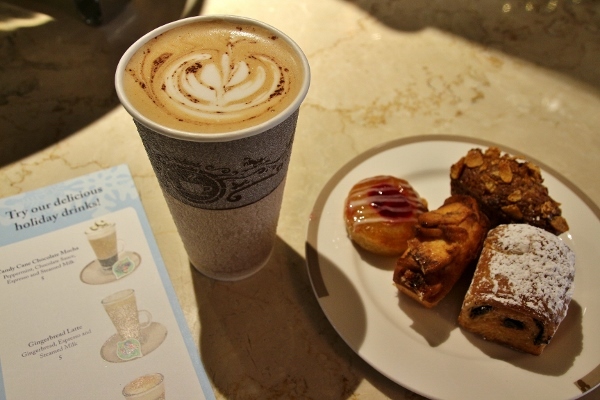 The pastries are complimentary but the coffees are an additional cost, although totally worth it! 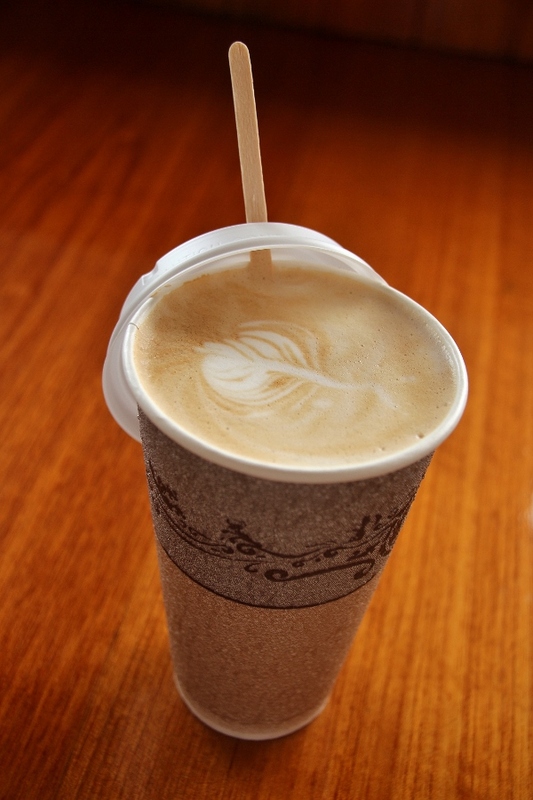 You also get a frequent customer card which earns you a free specialty coffee drink after 5 purchases. There were three of us this morning, so we each tried one of their special holiday-inspired drinks. 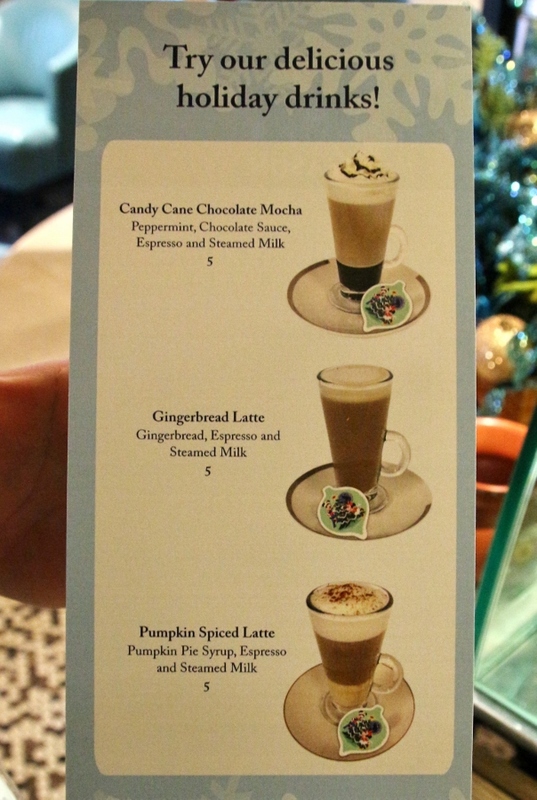 I chose the Gingerbread Latte, which was probably my favorite of the three, although I tasted and enjoyed all of them. Also, check out this amazing cold brew set up. It looks like a science experiment! 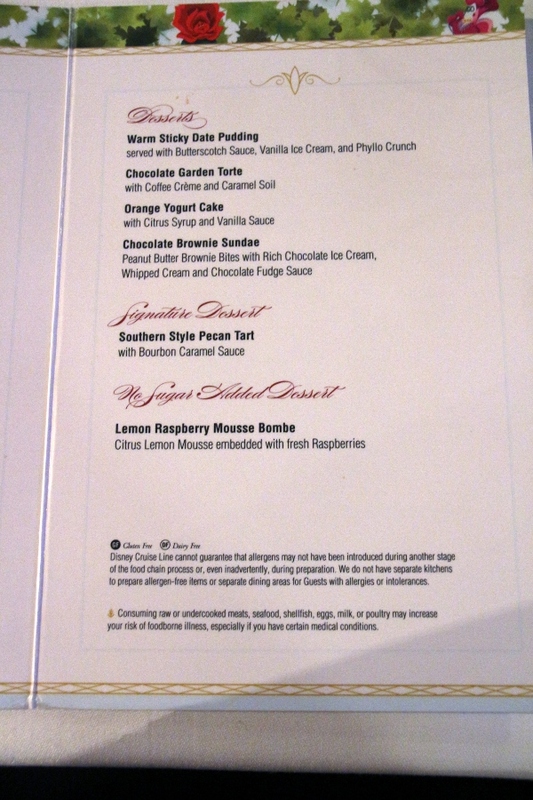 I wasn't too hungry after eating my fair share of pastries, so I grabbed a few items from the buffet at Cabanas and enjoyed them window-side in our stateroom. 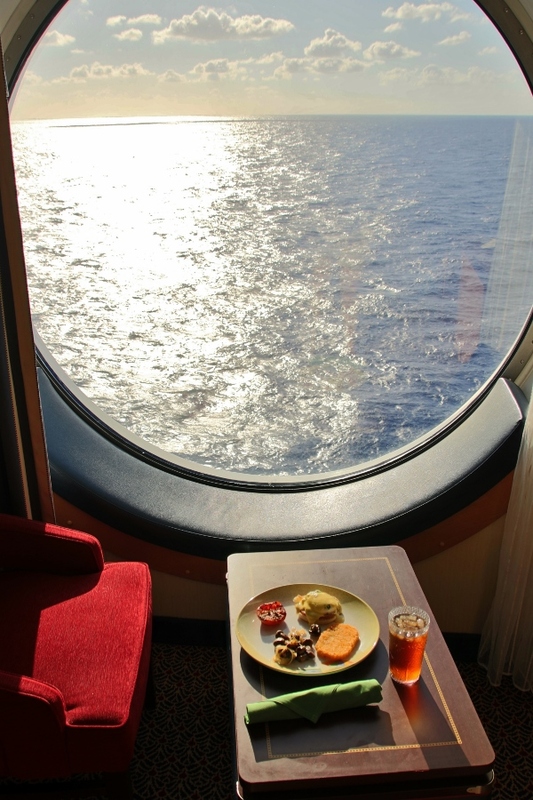 We love getting the Family Oceanview Staterooms as they are larger than standard Oceanview Staterooms, and feature large porthole windows with seating. After breakfast we spent some time at the pool, along with a couple trips on the Aquaduck. Before we knew it it was time for lunch already! 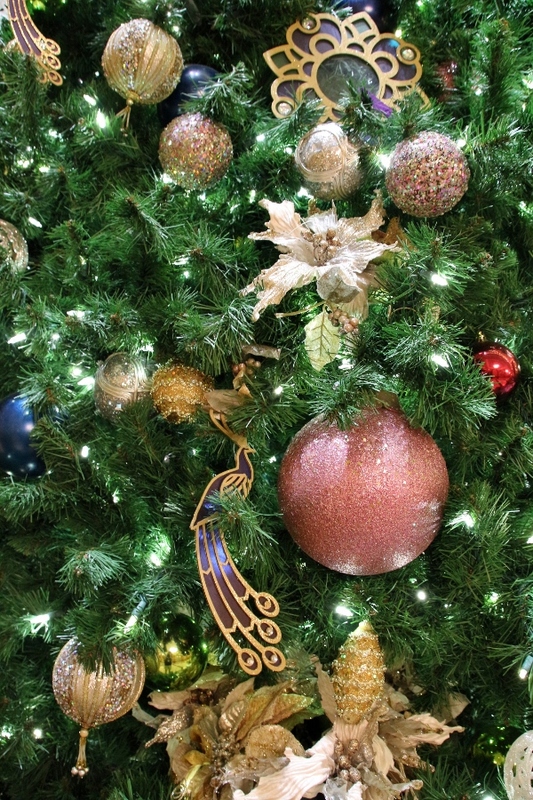 We headed to Royal Court for a sit-down meal. 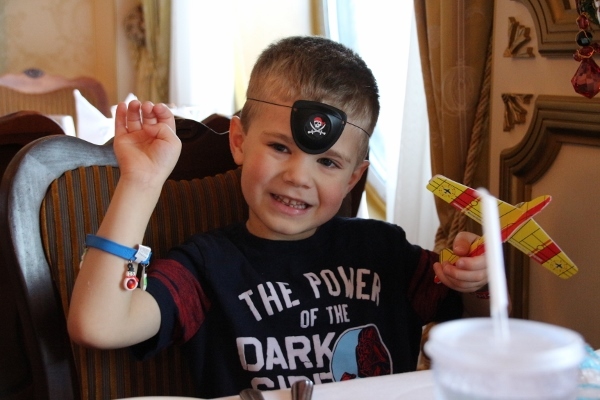 While we perused the menu, my youngest nephew David decided to wear his new pirate eye patch from one of his Fish Extender gifts (that's an unofficial Disney Cruise Line gift exchange with other staterooms) on the middle of his forehead over his third eye. What a clown! 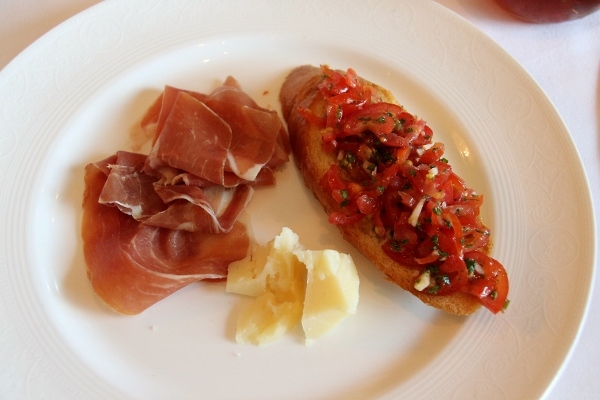 For my appetizer I selected the Sliced Serrano Ham with manchego cheese and tomato bread. This was nearly identical to my appetizer the previous night at dinner, except this featured tomato bread instead of bread with olive tapenade. I preferred the tomato bread much more, as it was way more flavorful, and both the ham and cheese had a less dry texture at lunch. I picked a second appetizer as well in lieu of a soup or salad. 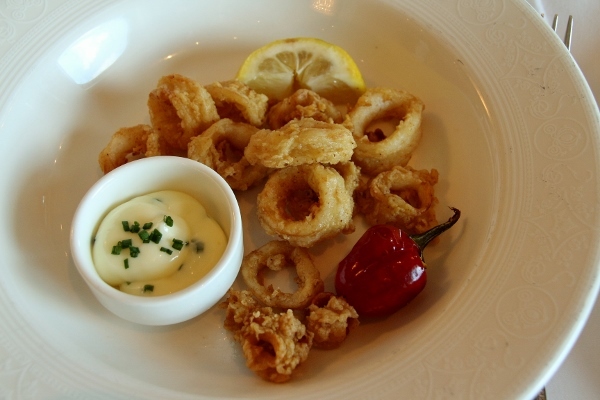 The Fried Calamari was served with aioli, lemon, and cherry peppers. I'm from Rhode Island, land of calamari, so I'm a pretty big critic. This calamari was actually quite good. It was tender (not chewy), crispy on the outside, and very well-seasoned. Good job, Disney! My entree choice continued with the seafood theme, but was disappointing compared to the calamari. 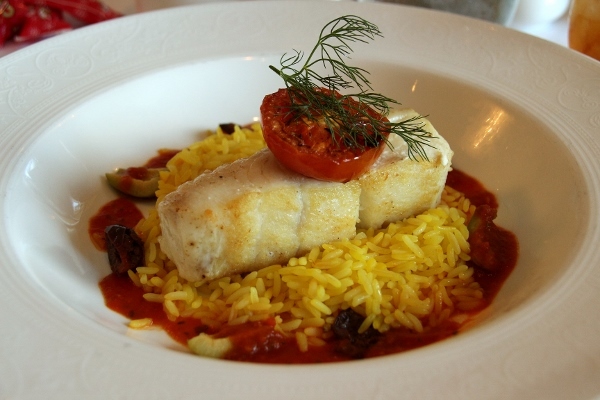 The Glazed Filet of Halibut with white wine, tomato, olive, and garlic reduction with saffron rice was just ok. The fish itself was somewhat dry and terribly underseasoned. The other components on the dish were good, and I filled myself with rice, tomatoes, and olives. 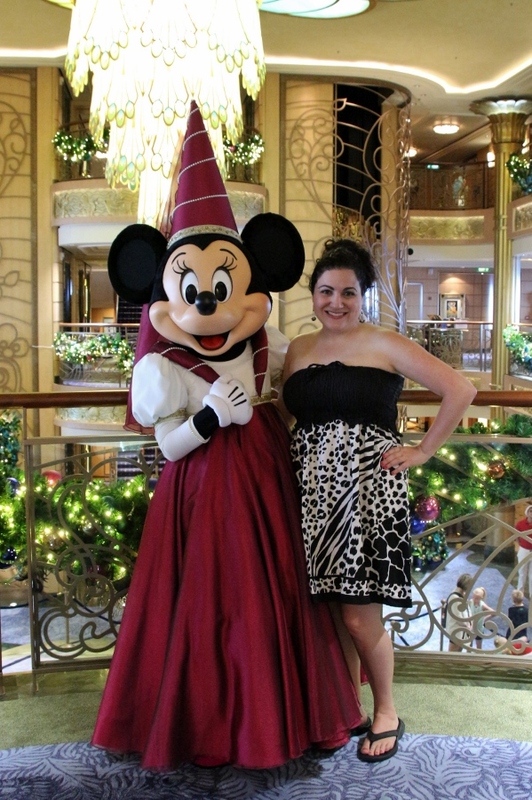 After lunch I rushed off to wait in line to see my BFF Minnie Mouse. She was wearing her Princess Minnie outfit, and was fabulous as always. 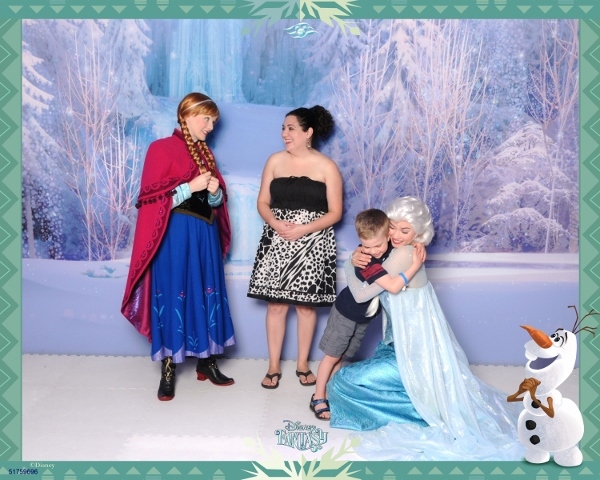 We actually had pre-booked tickets for myself, my sister, and my youngest nephew David for a Frozen Meet and Greet with Anna and Elsa. This is a popular experience, and you really MUST reserve your tickets ahead of time. 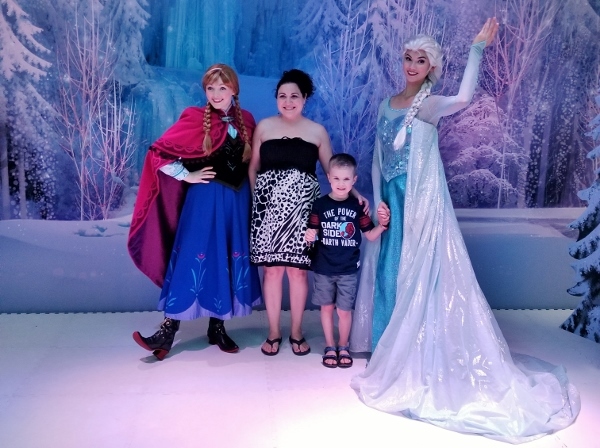 Our time slot was for 1 pm which gave us just enough time after seeing Minnie in the atrium to head over to Animator's Palate to meet the ladies from Frozen. 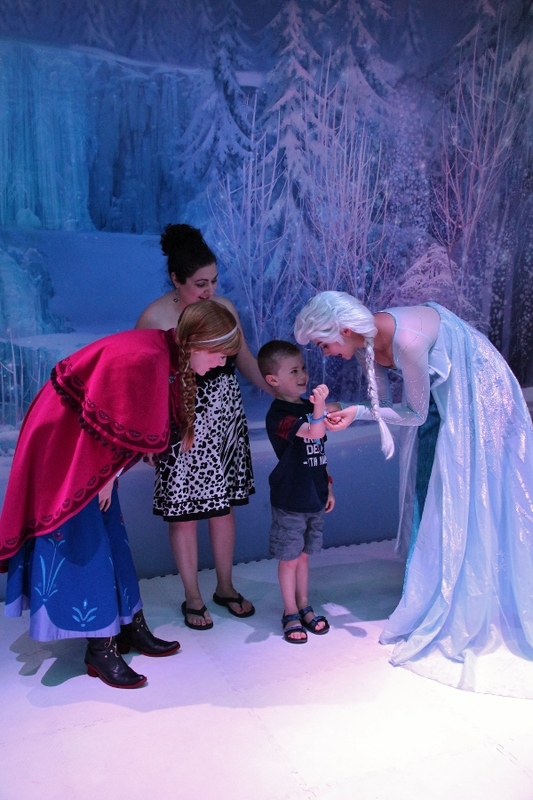 David LOVES Frozen, has since he was a toddler, so he was really excited to meet them. 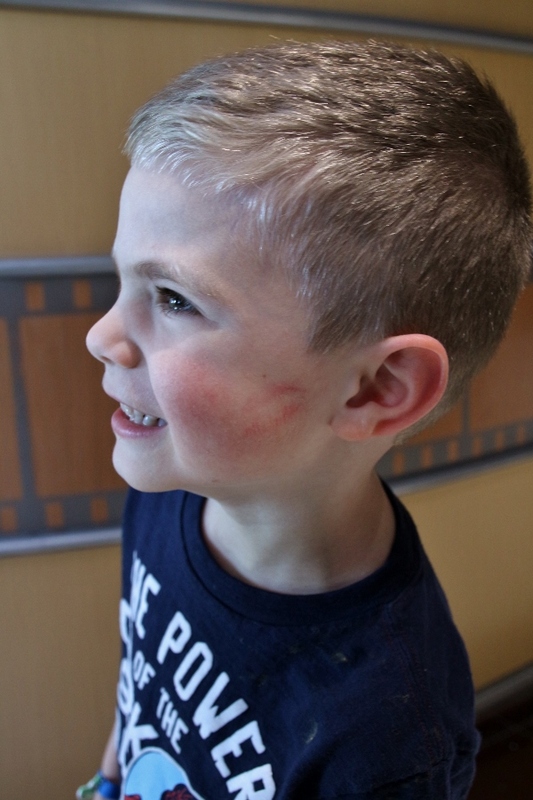 He showed off his new snowman bracelet (also a Fish Extender gift), and even got a kiss from Elsa which he had proof of on his face afterwards! This afternoon we sailed incredibly close to Cuba. The crew announced that it was the closest they had sailed by the island. 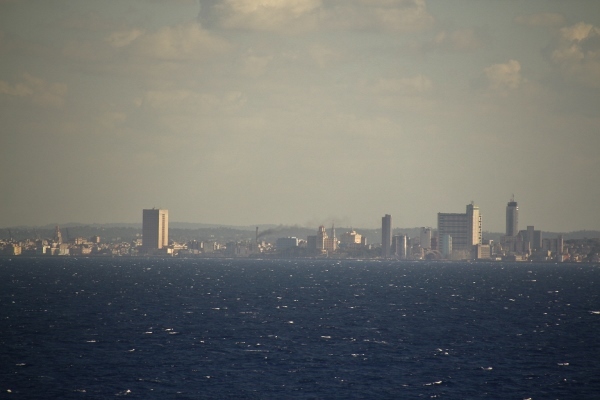 Not sure how true this is, but we were close enough to make out the skyline of Havana, and even see details of buildings when zooming in with my telephoto lens. 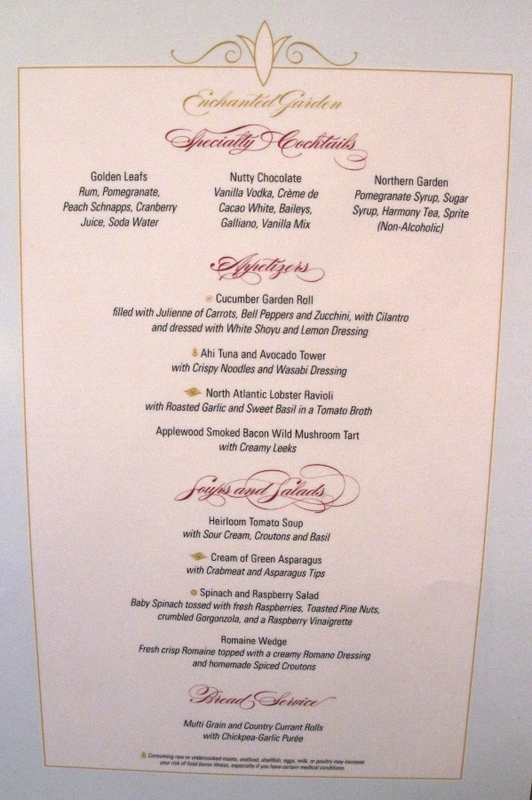 Dinner tonight was formal night, and our dining rotation put us in Enchanted Garden for the evening. We generally prefer this dining room to the others on the Fantasy as we find it to generally be the quietest, and Animator's Palate to be the loudest. 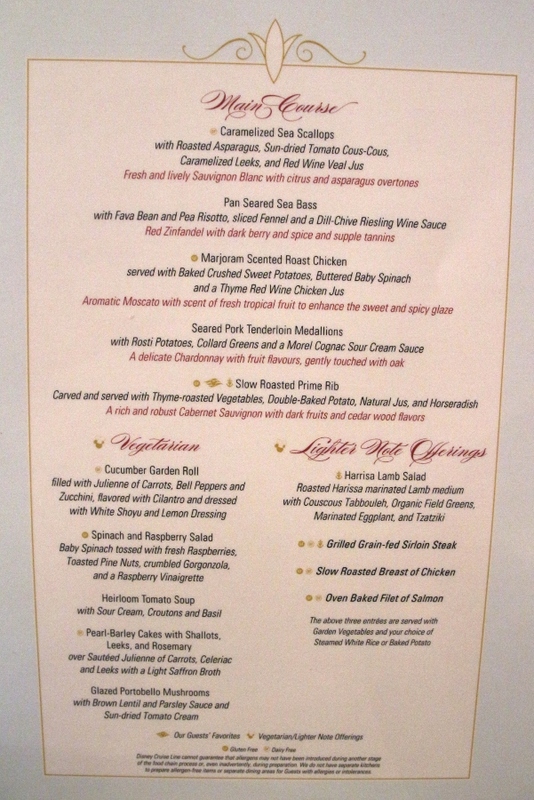 Once again I selected two appetizers and skipped the soup/salad option. 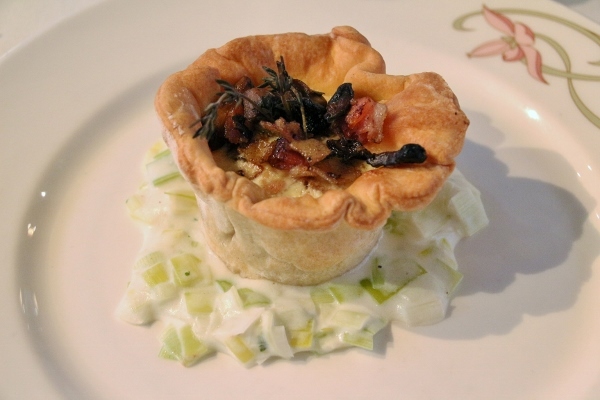 My first appetizer was the Applewood Smoked Bacon Wild Mushroom Tart with creamy leeks. It was basically like a mini quiche with bacon and mushrooms. It was good but very rich, especially when paired with the creamy leeks. I ate about half and then shared the rest with my brother-in-law. 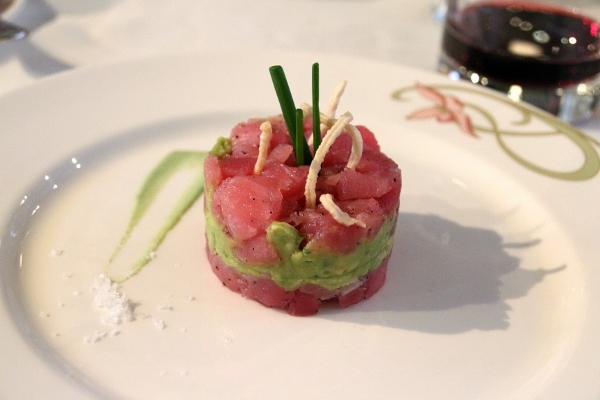 My second appetizer was one that I typically order every time I dine from this menu, the Ahi Tuna and Avocado Tower. It's a good choice, but something about it this time didn't live up to my experiences with it in the past. My family agreed. I'm not sure what it was, but it just didn't seem as great as it was before. I wonder if they changed something. Maybe the quality of the tuna? Or the temperature of the dish? It seemed pretty cold (almost too cold) and that could have impacted the flavor and texture perhaps. Hmmm. 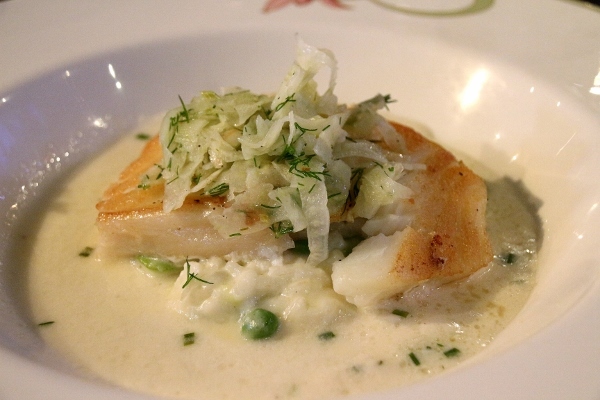 My entree was another tried and true favorite, the Pan Seared Sea Bass with fava bean and pea risotto, sliced fennel, and dill-chive Riesling wine sauce. The fish was cooked and seasoned well. Very tender. The only downfall (on a minor note) was the risotto. It wasn't perfectly executed (and yes, I know how hard it is to make risotto in massive quantities). Some of my grains of rice were undercooked, and the risotto had a slightly chalky feel to it (probably from the undercooked rice). It just didn't seem like it was cooked evenly. It wasn't horrible, it was pretty decent, but if we're splitting hairs here it was not as good as the same dish on past cruises. With that said, I'm holding Disney to a higher standard than most would. This is a food blog after all. 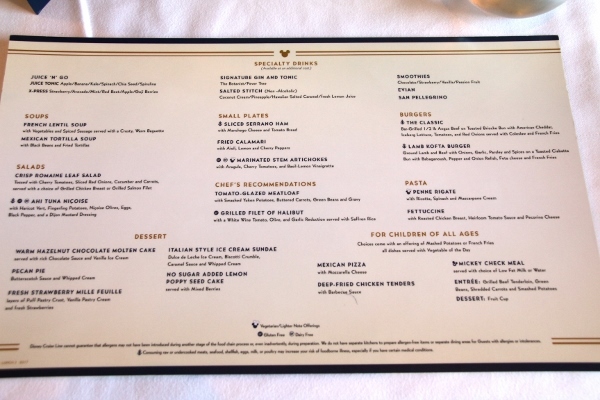 The food on Disney Cruise Line is arguably some of the best at sea, and my parents who have sailed on several other lines have confirmed that. 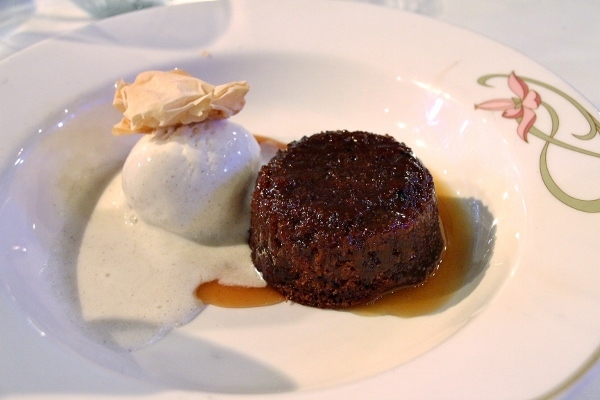 While the Southern Style Pecan Tart may be listed as the Signature Dessert, I would suggest the Warm Sticky Date Pudding with butterscotch sauce, vanilla ice cream and phyllo crunch. 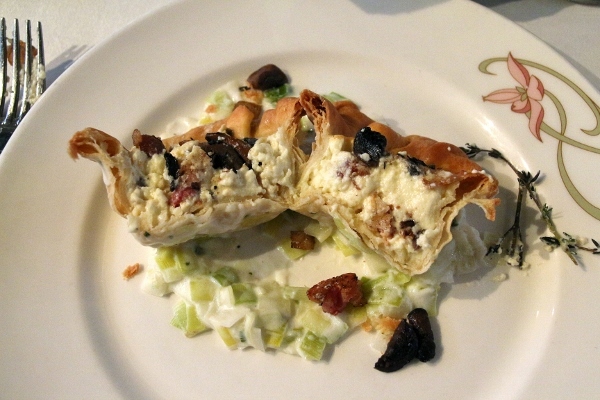 It is pure decadence, and truly the definition of comfort on a plate. 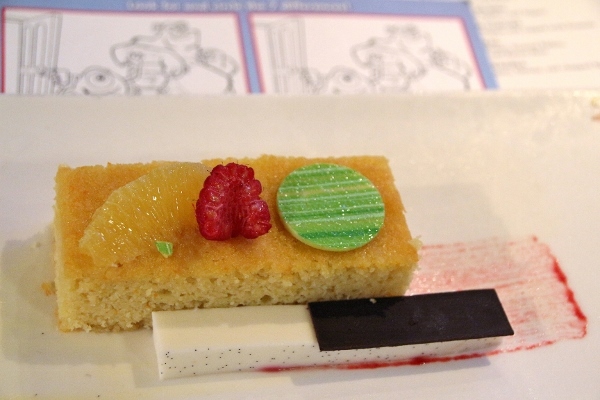 Here's a photo of the Orange Yogurt Cake my sister ordered. She really enjoyed it as well! After dinner I dragged my mom with me to see Thor: Ragnarok, which I had already seen in theaters but needed to see again since it's so amazing. After getting out of the Buena Vista Theatre at the end of the show we happened upon a crowd in the atrium, so we figured we should see what was going on. 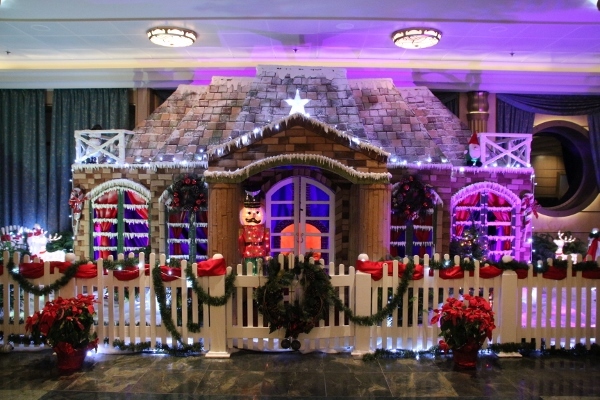 Turns out we were just in time for Santa's Winter Wonderland Ball, which is when Santa and Mrs. Claus make their first appearance on the ship. Afterwards, Anna and Elsa greet the crowd, and Elsa uses her magic (oh yes!) 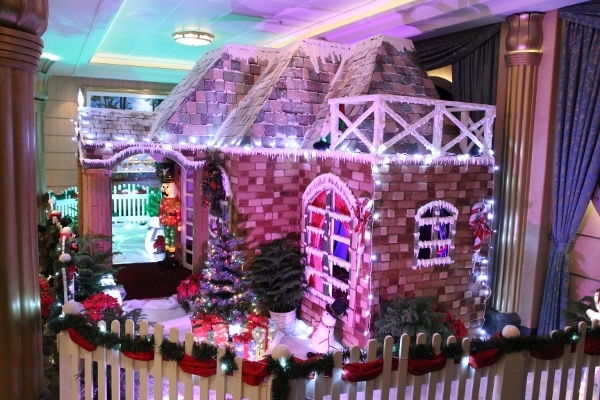 to make it snow in the atrium! 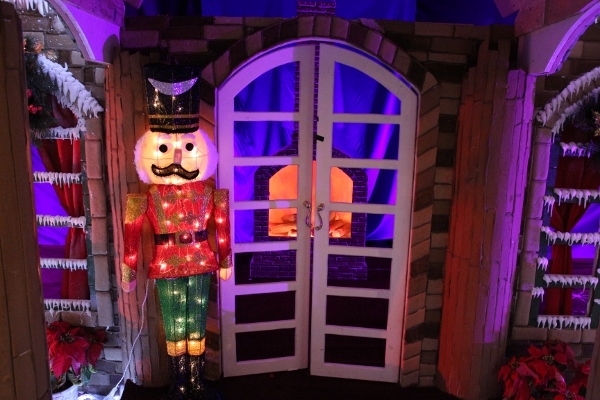 What an incredible surprise, and something totally magical even for adults. 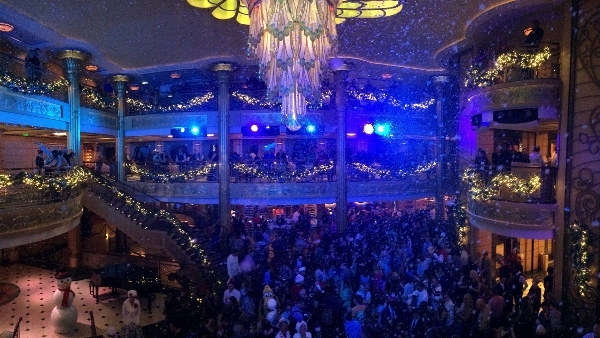 Who would expect a massive atrium filled with (artificial) snow swirling through the air. It was definitely one of the coolest (see what I did there?) experiences from the trip! 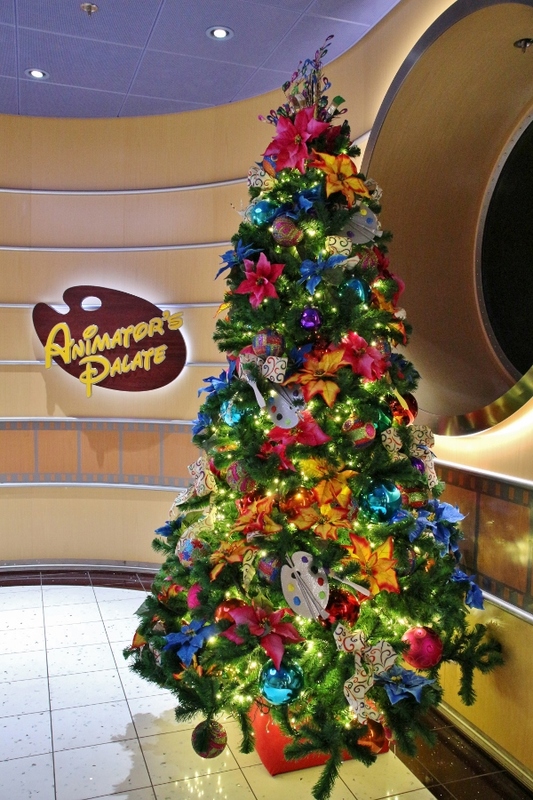 Tune in next week for more adventures from our Very Merrytime cruise aboard the Disney Fantasy!